If thy soul check thee that I come so near, Swear to thy blind soul that I was thy Will, And will, thy soul knows, is admitted there; Thus far for love my love-suit sweet fulfill. Will will fulfill the treasure of thy love, Ay, fill it full with wills, and my will one. In things of great receipt with ease we prove Among a number one is reckoned none. Then in the number let me pass untold, Though in thy store’s account I one must be. For nothing hold me, so it please thee hold That nothing me, a something sweet to thee. Make but my name thy love, and love that still; And then thou lov’st me, for my name is Will. Do that much for love and sweetly fulfill my love-suit. Yes, fill it full with wills, and with my one will. A single thing in it is not worth counting on its own. Although I must be considered a part of your complete tally of men. My being nothing is sweet to you. And then you will love me, since my name is Will. Kim, Suzy. "Shakespeare's Sonnets Translation." LitCharts. LitCharts LLC, 11 May 2014. Web. 21 Apr 2019. Kim, Suzy. "Shakespeare's Sonnets Translation." LitCharts LLC, May 11, 2014. 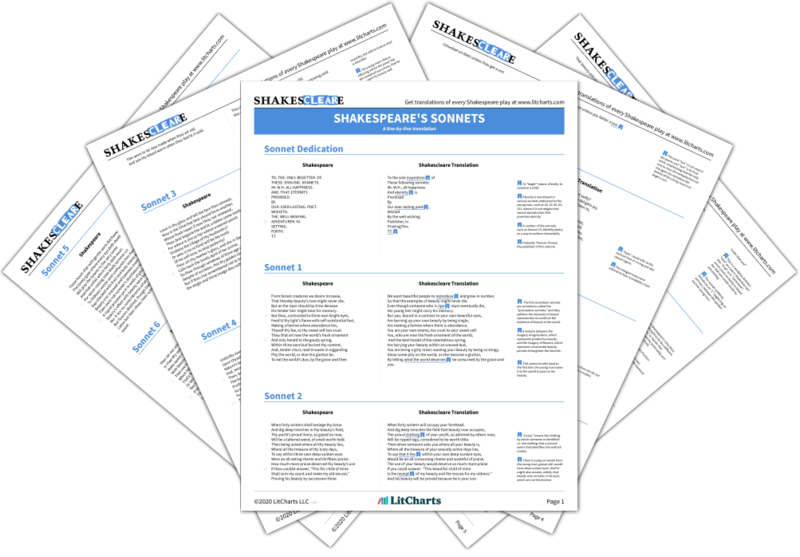 Retrieved April 21, 2019. https://www.litcharts.com/shakescleare/shakespeare-translations/sonnets.